Goodwell, Okla. - In a day and age when the perception of intercollegiate athletics is often shaped by soundbites and social media postings – and frequently in a negative context – Texas Wesleyan University and Oklahoma Panhandle State University shared a situation this weekend that reminds us all what is truly right in the world of college sports. It all began as the No. 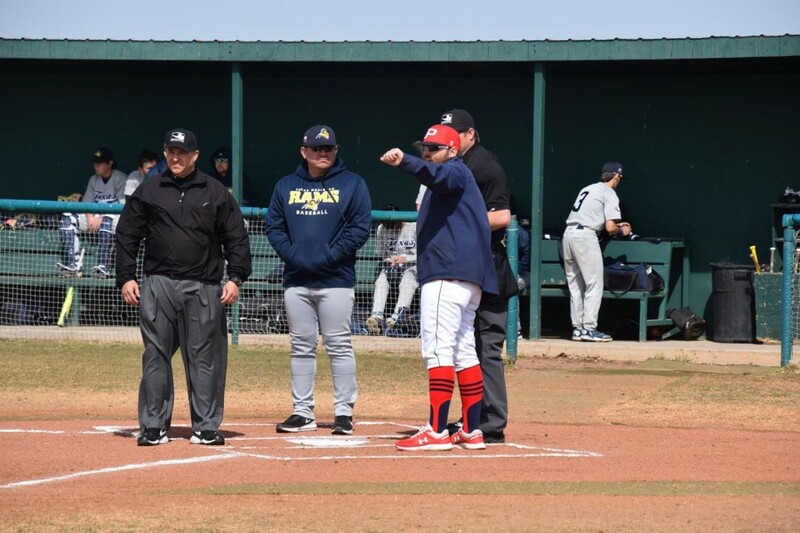 21-ranked Rams baseball team was traveling to Goodwell for a three-game series versus the Aggies. TWU was approximately four hours into the six hour trek north, when its team bus caught fire and could not continue around 9 p.m. last Thursday. With no chance for another bus to reach the team anytime soon and van rental not available for the stranded Rams, OPSU Director of Athletics Meghan Mulcahy, baseball Head Coach Jason LaRocque and his staff immediately sprang into action to assist their Sooner Athletic Conference mates. Mulcahy made arrangements for OPSU vans and LaRocque – along with assistant coaches Brandon Mercer and Haden Adams – went to pick up the TWU entourage, getting them to their hotel around 2 a.m. on Friday morning (and with a 12 p.m. doubleheader later that day). "Our faculty, staff and coaches are the real heroes in so much of what we do," Panhandle State President Dr. Tim Faltyn said. "I'm so proud of my people for how they handled themselves...doing the right thing because it's the right thing. We may compete fiercely on the field, but ultimately we're all in this together. I have no doubt that TWU would have done the same for us." As for the account of the selfless efforts of the Aggies' staffers, it only became known due to a thank you message from TWU Director of Athletics Ricky Dotson to Dr. Faltyn. Dr. Faltyn continued: "To give you an idea of (the OPSU staff's) humility and character, they didn't even tell me what had occurred or what they did." The situation was another good example of the National Association of Intercollegiate Athletics' (NAIA) Champions of Character program philosophy, which is designed to change the culture of sport and to instill the values that build character so students, coaches and parents know, do and value the right thing on and off the field. And for all who pay attention to college athletics, it demonstrated the common values shared by those involved. Values where competition stops at the out-of-bounds lines and respect, sportsmanship and a caring attitude permeate every aspect of our intercollegiate programs. Back row (left to right): Jabrel Alexander, Sean Skipton, Jockson Bilbrey, Braxton Dain Hayden Ukens, Steve Martin. Middle row (left to right): Cameron Branch, Jorge Rosas, Jeremy Norris, Stetson Elam, Gustavo Sanchez and Firas Ghazouani. Front row (left to right): Tanner Daniel, Lelin Liu, Melody Ethley, Madilyn Rider, Amanda Blanton, Kim Tuttle.